I'd like to share with you some products I use on a daily basis that make my life a lot easier which you can find in the Frill-Ability Amazon Associates shop. They might not work for all of you, but I hope their uses resonate with some of you. I want to make this a regular series in order to: a. let others know these things exist, and b. give you my perspective on how accessibility and sustainability can intersect. Let's get into the products! On the go, I use a S'Well water bottle, but I discovered it didn't take long for bacteria to grow on its outer rim and cap's crevices. I am the type of person who needs to let water sit overnight and sometimes for even a few days due to how often I am in bed. While browsing, I came across copper bottles and remembered copper has antibacterial properties. As the aforementioned article notes, this is specific to dry copper, so if you're seeking a copper water bottle, you still should periodically empty and clean it. Nonetheless, I have noticed a huge difference with the Cretoni Copperlin Pure Water Bottle. I chose it because it was on average the best reviewed, most reviewed, and best looking compared to similar products. When it arrived, the packaging was a little rough, but the item itself was unharmed. You might notice in the item description on Amazon there are numerous health claims. Please don't believe these; none of them are scientifically proven. If you have a compromised immune system like I do, this might be a good choice for home use. I was getting a lot of sore throats, and I couldn't figure out why. I would clean all of the nasty parts of my water bottle regularly and vigorously, but eventually, when I used it often, it started developing a smell that wouldn't go away, even when technically clean. When I started using the copper bottle, I noticed less inflammation in my throat. My S'Well bottle seems to be okay now as long as I am only using it for a day trip and clean it before each subsequent use. The copper bottle is rather large and doesn't have a fantastic seal, so it's perfect for home. If you're in bed a lot, keep it on your night stand or a side table. You can stand it up in bed a little, but if it's knocked over, it will slowly leak. I do like it a lot, and I am on the look out for a smaller size with a strap that I can attach to my fanny pack. 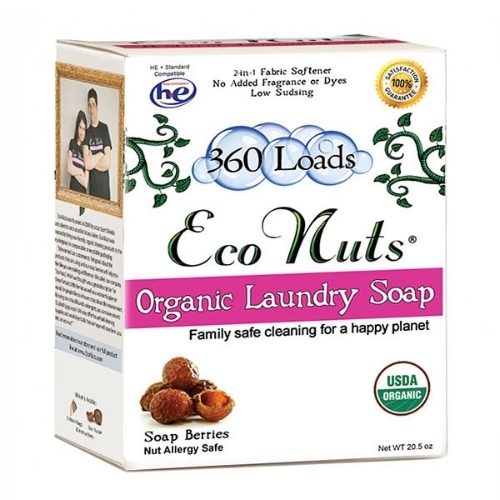 I kid you not: I have the 100 loads version of Eco Nuts Organic Laundry Soap which I bought nearly two years ago, and I still have a bunch left. Currently, only the 360 loads version is in stock which is around $30. It sounds excessively expensive for detergent, but when you realize how much money you save, it's a no-brainer. They are berries from the Soap Berry Tree which contain a saponification agent, AKA, they make soap! Yes, I really did purchase these in October 2016, nearly 2 years ago, and I have this many left! The product itself has worked marvelously for me. I have not noticed a scent on my clothing post-wash, and I am very olfactory sensitive. The Eco Nuts (which aren't really nuts) do not irritate my sensitive skin, and they clean garments equally to most other detergents I've tried. As long as you don't have a very specific allergy to this plant, Eco Nuts save you money, help your body, contribute to a more equitable society, and create less waste. What's not to love? I am a one-person, paper towel DISASTER. I use more than I will ever admit. Knowing I needed to do something about my wastefulness, I decided to supplement my usage with both recycled disposables and reusable cloth towels and napkins. Due to my contamination phobia, reusable towels aren't always an option for me, but I make the choice when I can. Gina's Soft Cloth Shop on Amazon is a favourite of mine. Their products vary from designed to plain in multiple colours, sizes, and ply-strength. They are durable, soft, and do exactly what they should. I mostly use them for handkerchiefs and napkins, and I plan to purchase and implement more for paper towel usage, too. If you have contamination issues like I do, jut throw them in the wash as soon as you feel they are too icky. Out of sight, out of mind. They wash well with the Eco Nuts. I prefer cleaning them altogether to save on water and time. Just being low-income is worth it to justify spending a little more than you normally would on any of these products because you won't have to buy them again for years. It feels like cheating at life or a consequence free wish from a fairy. Simple, adaptable, sustainable solutions like these make me incredibly happy. When little things pile up on my list of worries, I am at my most overwhelmed. Having the right tools to streamline my life allows me to feel human. I hope they work for some of you as well. Please share your experience with adaptable, sustainable products in the comments below. I'd love to hear about your favourites! Once I'm all settled in my new home, maybe we'll do a giveaway!